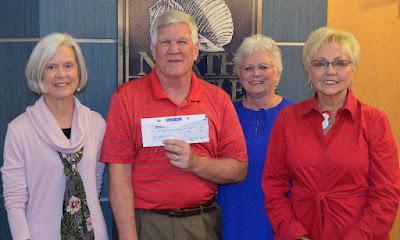 During the December 3 North Myrtle Beach City Council meeting, Sandhills Bank representatives Frankie Jones and Susan Ford presented the City with a check in the amount of $1,451 for the North Myrtle Beach Shop with a Cop program. The funds were collected during the annual Mayfest on Main® Festival. Managed by the City’s Public Safety Department, Shop with a Cop provides children in need with a $150 Walmart gift card with which to purchase presents and necessary items, such as winter coats. The children also are treated to a holiday lunch.